Hilton Head Island was captured by Union forces on November 7, 1861 after the Battle of Port Royal. The enormous amphibious invasion force, the largest until World War II, consisted of 77 ships (15 warships), 13,000 troops, 1,500 horses and tons of materials needed to establish the headquarters for the South Atlantic Blockading Squadron. Three years later Fort Howell was built by black Union Army troops to protect Mitchelville, the first town in the South developed specifically for the thousands of newly freed slaves. 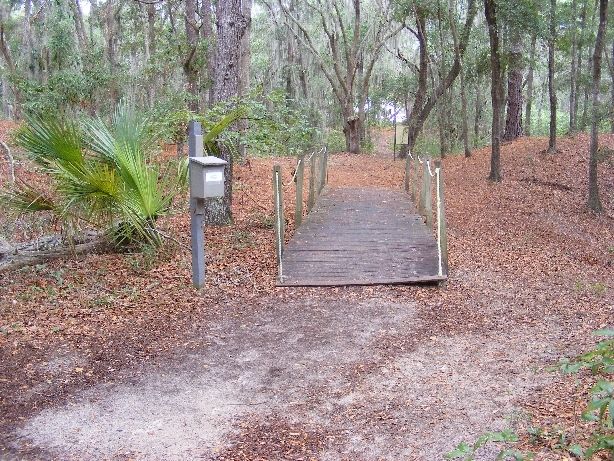 Fort Howell historic site is located near the intersection of Beach City Road and Dillon, right across from Hilton Head Airport. Admission is free, the site is open daily from dawn to dusk and it takes about 15-20 minutes to cover all the grounds. 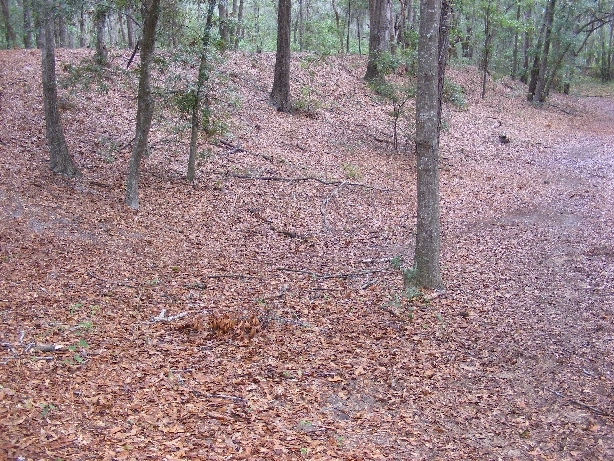 •	The earthen fort was named after Gen. Joshua Howell, who was killed in the battle of Richmond. •	The newly arrived 500 members of the 32nd U.S. 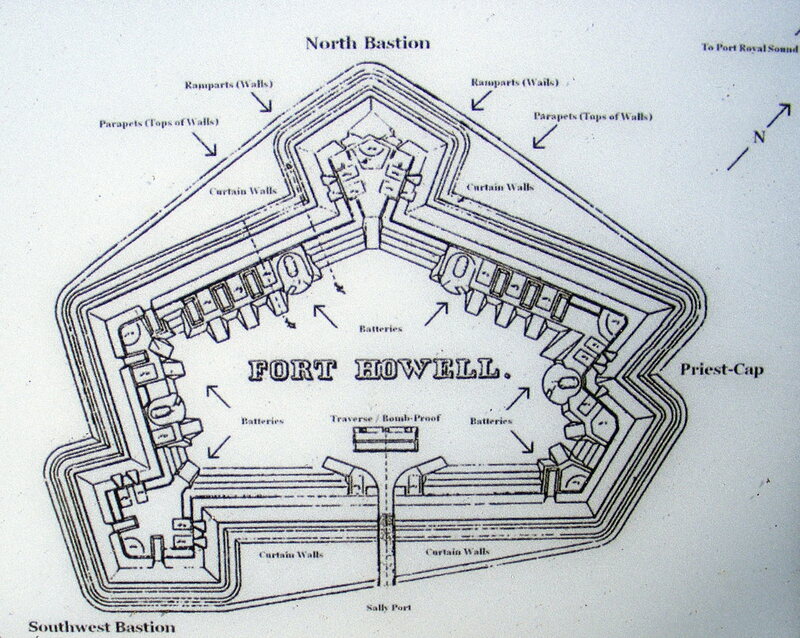 Colored Regiment from Pennsylvania, under the command of Col. Baird and the 144th New York Infantry, were assigned the task of building the fort. 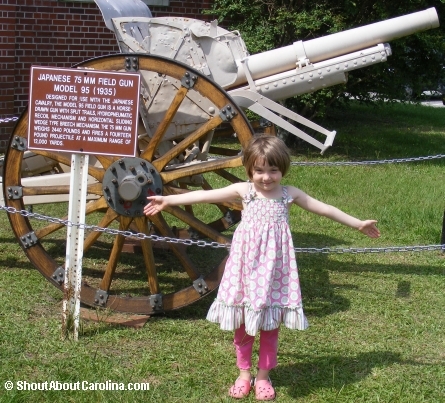 •	Fort Howell was built in the middle of a large cotton field near the Port Royal Sound, on 3 acres of land once part of the Fish Hall Plantation of William Pope. •	It was designed for 27 guns, 11 field pieces and 16 siege guns. After building the fort, the 32nd U.S. Colored Regiment participated in the Battle of Honey Hill, on November 30, 1864, sustain 51 casualties. “Now, be it known to all that, agreeable to the laws, I declare the said person free and forever absolved from all claims to its services. Both he and his wife and his children have full right to go North, South, East, West as they may decide.” D. Hunter Major General Commanding. April 19, 1862. The unit was disbanded months later. Congress did not allow black men to serve until 1863, when the unit was officially organized as the South Carolina First Regiment. The men in the unit were former slaves from South Carolina, Georgia and Florida. By the end of the Civil War, 179,000 blacks in the Union Army and 20,000 in the Navy have fought for freedom and the end of slavery. Here is the map, all markers are within 1 mile from Fort Howell and have free admission. The Hilton Head Island history is rich and powerful, with the Civil War period as its most fascinating and nation-impacting act. We were lucky to experience it last summer, during the “Forts of Port Royal” tour provided by the Coastal Discovery Museum. This part is the hardest to digest and enjoy by young kids. Amazingly, my then 4 years old, was happy to just doodle on the couch next to me. 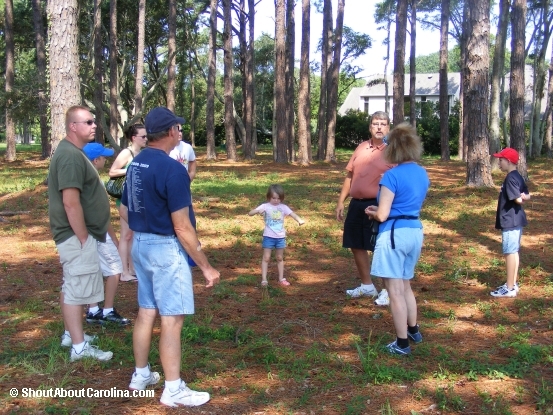 • You are expected to drive your own car to Westin (where the tour starts) and the Fort Walker / Fort Sherman ruins inside Port Royal Plantation. Our guide courteously offered to drive us in his car, which we did. • It gets very hot during summer. Bring a hat and water; wear sunscreen and insect repellent. Once on the fort grounds there is very little walk involved. •	Before the Civil War, South Carolina was one of the richest states. Thanks to its staple crop, the extra long and super fine Sea Island cotton, Hilton Head was believed to house the world’s most millionaires per square feet! •	Fort Walker was the first fort built on the island, near the spot claimed by British Captain William Hilton during its famous expedition in 1663. Erected in a hurry in 1861, the fort was meant to protect the South Carolina coast against Union attacks. •	On November 7, 1861, the “Battle of Port Royal” became the largest naval battle ever fought in American waters. 18 Union warships and 55 supporting craft led by Admiral S. F. DuPont, carrying 13,000 troops, 1500 horses, 500 surf boats, and 1,000 laborers, bombarded for over 4 hours Fort Walker and Fort Beauregard. •	The Battle of Port Royal established Hilton Head as the headquarters for the South Atlantic Blockading Squadron, started the war-long attack on Charleston, and led to the creation of Mitchelville, the first town developed specifically for the newly freed slaves. Mitchelville became the birth of the rich Gullah culture and was also the sight of the first mandatory education system in the United States! of General Thomas F. Drayton, a prominent local plantation owner, politician, and president of the very profitable Charleston – Savannah railroad. Amazingly, his brother Commander Percival Drayton will lead the Union Navy attack, including the USS Pocahontas, which was credited to have inflicted the most damage during the battle! •	Despite heavy bombardments there were less than 100 casualties, a significant low number by later Civil War battles standards. •	Following the battle, close to 50,000 Union troops were quartered on the island, more than the number of today’s residents! 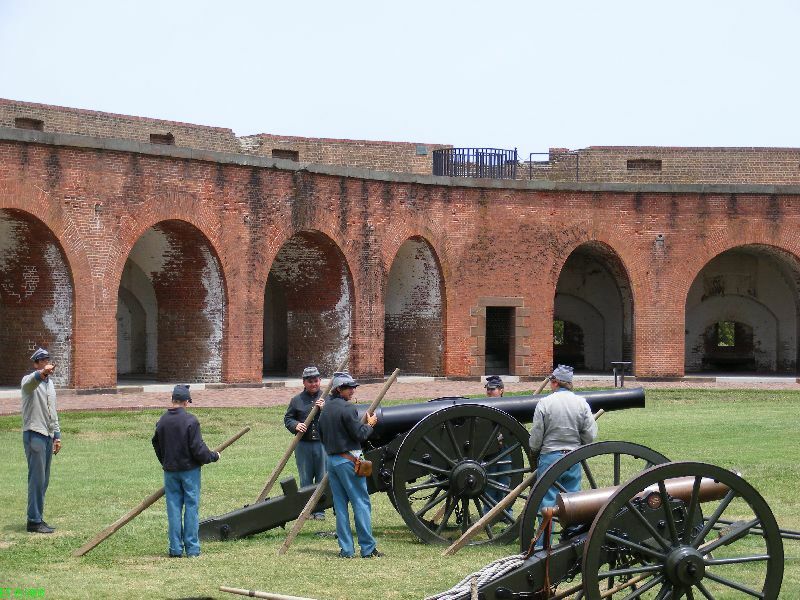 If you are really into Civil War fort battles, then drive 1 hour south to Savannah and visit the legendary Fort Pulaski. There are live cannon and musket firings in the weekends. Admission to the park is less then $5 (free for kids). Featured on the National Register of Historic Places, the Leamington Lighthouse, is a legendary historic site on Hilton Head Island. Originally known as the Hilton Head Range Light Station, the unusual skeleton and cypress wood structure was built to guide ships into Port Royal Sound. •	In 1863 Union troops built the island first light, but only 6 years later the original tower was destroyed by a storm. •	In 1881 a pair of range lights was erected to guide vessels into Port Royal Sound. The front light stood 35 feet high right above the keeper’s house while the rear light was served by the 95 feet high skeleton-like tower. The cypress wood lantern and watch room were reached by climbing 112 steps. •	In 1884, a mobile front range light was constructed to track the shifting channel. •	In 1932 the lights were decommissioned and during World War II the surrounding area became Camp McDougal, a training facility for Marines men, dogs and horses. 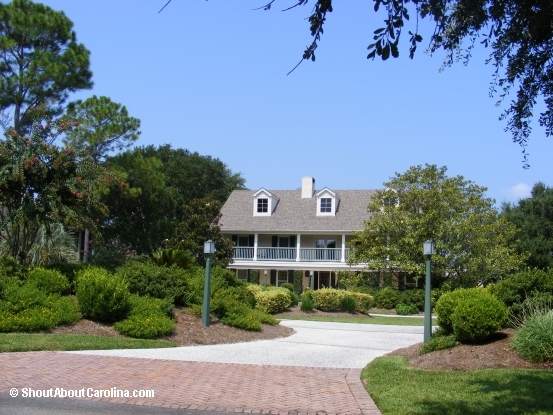 •	In the 1960s, the keeper’s dwellings were moved to Harbour Town at Sea Pines Plantation Resort. Currently, one dwelling serves as a Bakery and Cafe, while the other is home to the Sea Pines Real Estate Company. •	In the mid 1980s the lighthouse was incorporated into the new Arthur Hills Golf Course at Palmetto Dunes Resort. •	Today the only remains are the old brick oil house and the cistern. In 1898 a powerful hurricane washed over the island. Keeper Adam Fripp rushed to protect the lights. Drenched in heavy rain, Fripp made his way to the tower and up the spiral staircase. A powerful gust of wind shattered one of the glass panes in the lantern room. The strain of the ascent coupled with the shock of the exploding glass was more than Fripp’s heart could handle. His daughter Caroline noticed her father’s prolonged absence and went in search of him. Several days passed before anyone made it to the island. Caroline had managed to tend the light throughout the storm, but her sorrow and exhaustion proved too much, as she died shortly thereafter. People say that on dark rainy nights a girl in a blue dress may be seen on the beach or near the skeleton tower signaling with her arms to “Go back… Go back”. Avid for more ghost stories and romantic sites? 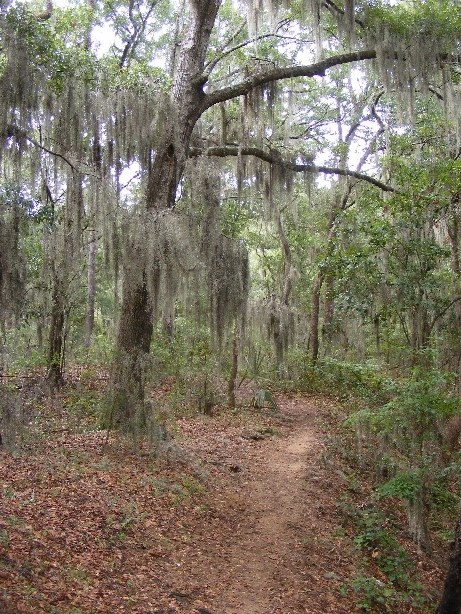 Drive to Sea Pines Plantation to wander around the haunted Stoney-Baynard Ruins and 4,000 years old mystery-filled Indian Shell Ring. Hurray for the new butterfly exhibit at the Coastal Discovery Museum on the Honey Horn plantation. Children of all ages will be delighted to walk around jolly butterflies and see them emerge from chrysalises. The outdoor garden is a shutterbugs and green thumbs mecca. There are so many beautiful flowers, plants and trees butterfly love to visit. 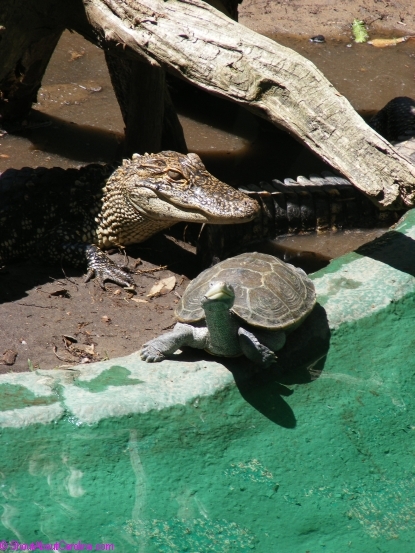 You can tour the habitat for free at your own pace every day from 9AM to 4:30PM (11-3 on Sunday). Through September the museum offers guided tours on Mondays at 10AM and Wednesdays at 3PM for $10 adults and $5 children 4-12 years old. Amazing escape artists butterflies resort to all sorts of tricks to survive. Some, like the Monarch, parade bright color wings to advertise their are toxic to eat. Others, like the Viceroy, take the shortcut and just mimic butterflies who are toxic. Most butterflies learn to blend in the surroundings resembling leaves, sticks and even bird droppings! My favorite is the Buckeye that has owl-like patterns to scare off small birds. are a common sight to herb gardeners, easily devouring entire plants once they start eating! The Black Swallowtail is one of the earliest butterflies to hatch (mid-March), after spending the winter as chrysalises. Host plants: Water Hemlock, Queen Anne’s Lace, cumin, parsley, carrot, cilantro and celery. The Giant Swallowtail when disturbed it ejects stinking chemicals to repel small predators like ants and spiders. Host plants: Toothache and Citrus family trees. The Eastern Tiger Swallowtail winters on Hilton Head as a pupa. Males often patrol the treetops and swoop down to intercept females for mating. The caterpillars change their appearance with each molt: first looking like bird droppings, then turning green and showing two large eye spots, and finally, changing brown as they start to pupate. The Eastern Tiger Swallowtail is the state butterfly for Alabama, Delaware, Georgia, South Carolina and Virgina. The Zebra Longwing males are attracted to both adult females and those still in their chrysalis, mating with them before they emerge. Afterward they’ll deposit chemicals on the female abdomen that will repel other males! Power in the numbers! The Zebra Longwing engage in communal night roosting when you can see up to 25 individuals hanging from a tree brunch. Unlike other butterflies, the Longwing specie can also digest pollen from flowers. The amino-acids allow them to live much longer than the average 2-3 weeks butterfly life span. Host plants: Maypop and Yellow Passionflower. The Gulf Fritillary – Although the larvae are solitary feeders once in adult stage they can be seen congregating in large numbers, enough to completely defoliate a plant. Stay Out! The larvae displays bright colors to advertise its toxicity to potential predators, thus it is mainly left alone. During the northward migration females deposit eggs for the next generation. The 3rd and 4th generation will reach Canada by the late spring and in fall the last generation enters a non-reproductive stage lasting several months. They will migrate south and winter in California and Mexico. The adult butterfly lives around 2-3 weeks although there are few like the Monarch and Zebra Longwing that live for months. Butterflies spend their time eating, looking for mates, reproducing and in the case of females, laying eggs. At this point their life cycle is complete. Butterfly eggs are about 2 mm in size and usually hatch out within a week, although for some species it happens the next spring. Live metarmorphosis, see caterpillars and chrysalises develop before your eyes! Most butterflies lay about 100 to 300 eggs, yet the number varies wildly with each specie, from dozens to several thousands eggs. The caterpillar is the only stage the butterfly grows in size. Most caterpillars grow for 2 to 4 weeks, yet some species will winter as caterpillars. Some even develop false eye spots to fend off potential predators! The chrysalis stage can last from couple weeks to months. During metamorphosis tissues liquefy and change into the structure of an adult butterfly. •	A caterpillar grows 27 times larger than its original form. In human terms a 9 pound baby will end up weighing about 243 tons! •	Out of each 100 eggs laid only 2 will survive to become adult butterflies. •	Some male butterflies can detect a female up to a mile away based on pheromones emitted by her body. •	A butterfly can fly with half a wing. •	There are about 700 butterfly species in North America and about 28 thousands worldwide. 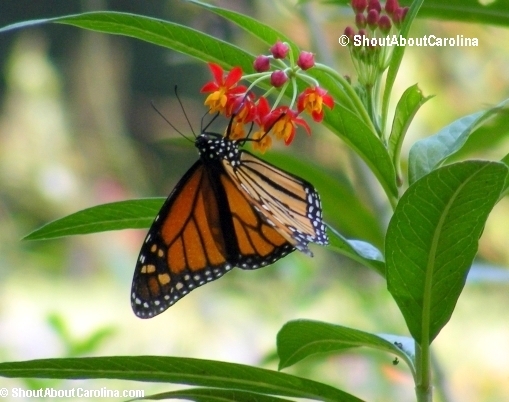 • Butterflies can see in all directions up, down, left, right, front and back all at once! They can also see in ultraviolet range light that’s invisible to humans. • Some butterflies can drink fluids from tree sap, rotting fruit, bird droppings and even animal carcasses! Now that you fell in love with butterflies drive to Columbia and visit Edventure children museum. It has a bigger facility featuring up to 10 species and over 200 butterflies. 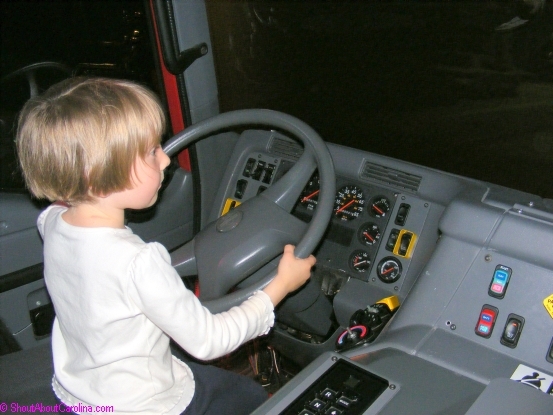 Check out this list with my favorite things to do with young kids in and around Hilton Head. Iron Mike – Erected in 1924 and designed by Robert Ingersoll Aitken. The two field pieces on each side are 2.95-inch Vickers-Maxim Mountain guns made around 1900. The drinking fountain nearby is dedicated to all Parris Island Marines who died during World War II. The heroic flag raising on Mount Surabach, Iwo Jima, in 1945 is an inspiration to all Americans as a symbol of freedom and personifies many of the Marines qualities: confidence, discipline, fidelity and the rugged determination to overcome insurmountable odds. This version of coated plaster was made by Felix de Weldon to raise money for the much larger bronze monument that was eventually erected in D.C.
Douglas Visitor’s Center – Over 100,000 people visit Parris Island each year. The visitor’s center is named for Paul H. Douglas who at age 50, enlisted in the Corps, becoming the oldest recruit to complete training. As a Captain, Douglas was sent to the Pacific theater in a non combat role. While there, he talked his way into a combat role, later receiving two Purple Hearts! undergoing rigorous training to prepare them for hand-to-hand combat. The main point of interest is the Confidence Course, first introduced in 1958 and updated in 2002. Constructed of logs, cables, pipe and rope, this tests coordination and endurance. Memorial Park and Molly Marine – Opposite Depot Theater, is a Memorial Park honoring the 5th, 9th and 14th Defense Battalions which trained at Parris Island during World War II. The centerpiece is a replica of the famous Molly Marine statue, dedicated to the service of all Women Marines. The original was commissioned during World War II by a Reserve recruiter in New Orleans. The sculptor, Enrique Alferez, was a Mexican immigrant who himself wished to become a United States Marine. 4th Recruit Training Battalion – Here is the training for female recruits. Women began serving in the Corps in 1918 in the Women’s Reserve. In 1948 females were integrated into the regular Marine Corps, and in 1949 the first class graduated at Parris Island. Now that you’ve worked an appetite dine at Traditions located nearby on China Hutung. Traditions, once near the Dry Dock, was converted to an officer’s club in 1920 and moved to its present location in 1939. Lunch is served Sunday through Friday. such as Navy dirigibles, Corsairs, Wildcats, B-25 bombers, a glider squadron and a barrage balloon detachment. Today, Page Field is part of the Weapons and Field Training Battalion. 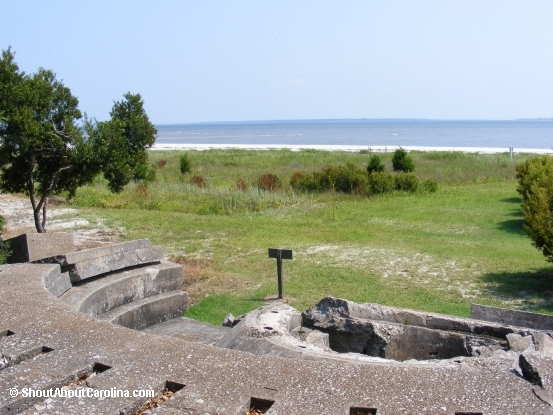 Charlesfort and Santa Elena National Historic Landmark – Along the 1/2 mile Nature and History Trail you can admire a crashed WWII bomber, the Parris Island lighthouse keeper’s home and the Santa Elena Monument. From here take the interpretive trail through the 16th century Santa Elena town site, one of the most historic early colonial sites in North America. Brochures are available at the entrance of Fort San Marcos or in the clubhouse. 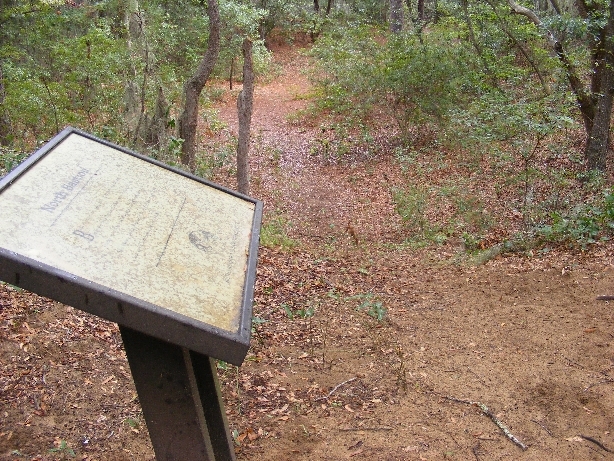 Artifacts from the site are in the Parris Island Museum. Rifle Range – Finish the driving tour at the Rifle Range, where recruits learn the basics of the M16A2 rifle. Each must become proficient in firing from the 200, 300, and 500 yards lines using various positions: off hand, prone, sitting and kneeling. Each marker in front of the ranges is named for a Korean or Vietnam war battle in which Marines participated. The first range is Inchon, followed by Starlite, Chosin, Hue City, and Khe Sanh. The pistol ranges are named Pusan and Mount Suribachi. Have great family vacation in Beaufort, SC!